We know that guy wearing the red Callicrate Beef Tshirt! And, we would like to give him – Tim Danahey, The Tim Danahey Show – a “shout out” for promoting local and promoting community in the March Against Monsanto! 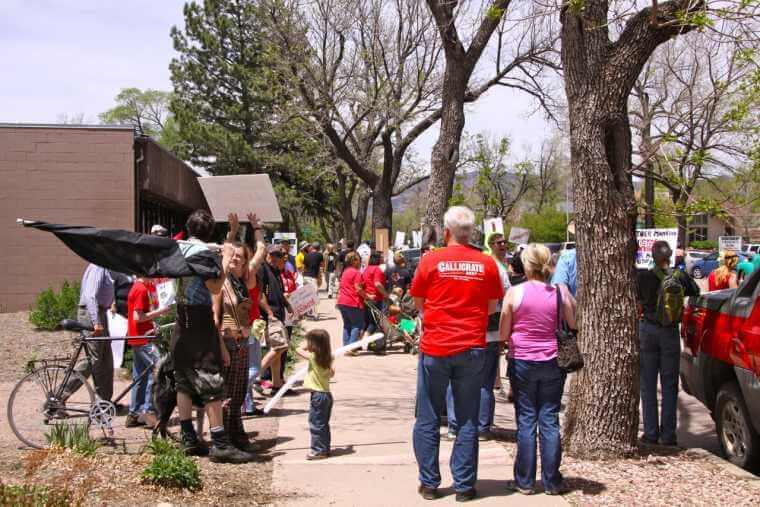 This photo was captured by Matthew Schniper with the Colorado Springs Independent from last Saturday’s local March Against Monsanto rally along Colorado Avenue. Thanks Matthew for sharing! As Matthew reported there, he counted nearly 300 demonstrators, who marched peacefully westward from their meet-up-point at Tabor Mountain Bakehouse. Worldwide, it was projected that some two million people marched. To view several more photos from the protest please click here. Would you like a Black or Red Callicrate Beef T-Shirt? Please call 719.473.2306 for details!